Immune System Support, Healthy Skin. 1000 Mg per tablet. 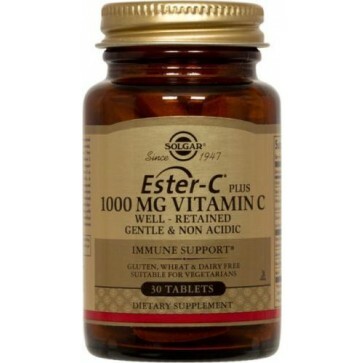 Solgar Ester C 1000 MG is a gentle non acidic highly absorbable form called Ester-C cacium ascorbate well retained, gentle, and non-acidic. It contains 100 mg of added calcium to ensure absorption with Citrus Bioflavonoids, Acerola, Rose Hips, and Rutin. Great for immune system support, healthy skin. Gluten, Dairy, Wheat, and Soy Free.